This is an absolutely stunning Old White / Off White coloured cotton lace of the finest quality, made in Britain by the 150 year old Cluny Lace company, the very last remaining Leavers Lace manufacturers in the UK. 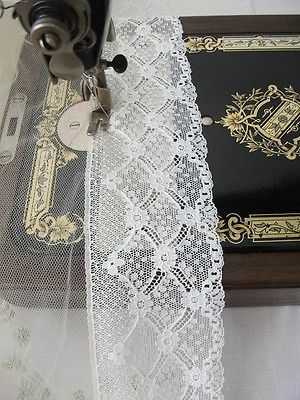 The lace has one straight edge to the top edge and a bottom scalloped edge. The pattern shows three interconnected garlands joined with small delicate little flowers, an old traditional Valenciennes pattern. 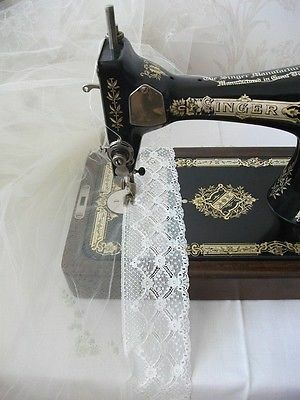 The lace is 70 mm wide at its widest part and is made from a very good quality fine gauge cotton. 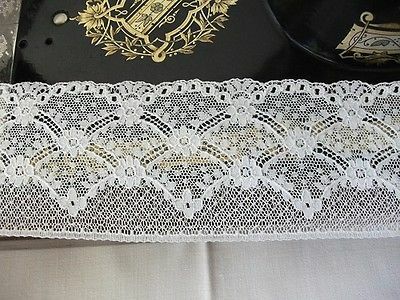 This very elegant lace looks beautiful as a tie for floral bouquets or arrangements, could be used as a trim for bridal or other ladies wear or to add elegance to lingerie. This is the very best quality lace made by the same manufacturers who produced the lace for Kate Middleton's wedding and bridesmaids dresses. Cluny Lace Company also supply the haute couture houses - Dolce & Gabbana, Etro, Christian Dior, Paul Smith, Vivienne Westwood and Burberry. They do not sell to retail shops, therefore you will not find anything like this on the High Street, so go on, treat yourself to a bargain whilst stocks last.